About this time of year lots of folks start organizing their summer RV travel plans. Fulltime RVers are planning thier travel routes, families are planning their RV summer vacations and RVers everywhere are planning their weekend RV excursions. Traffic on our highways increases dramatically during peak vacation season and before, during and after major holidays like the 4th of July. I thought this would be a good time to discuss some safe RV travel tips so you arrive at your summer RV travel destination safely. Getting there can be half the fun, as the saying goes, if you take a few precautions to make your RV trip safe. 1). The first step is to plan the trip you are taking. Travel guides, magazines, state tourism boards and Internet sites offer valuable information to help you plan your RV trip. Route your trip on a map or from an Internet trip planning site. Always keep an atlas or maps in the RV as well. Driving or towing an RV can be stressful, especially if you don’t know the route you will be traveling. Using a Global Positioning System (GPS) can make traveling much less stressful. 2). Complete a “Pre-Trip Checklist” before you head out on the road. Simple checks like checking your tires, lights, fluid levels, hitch set-up and other items all contribute to a safer RV trip. You should make these checks everyday before traveling. 3). Take plenty of breaks when you are traveling. Stopping, stretching out and taking brief walks can revitalize you. Do not rush to get to your vacation destination. Driving too fast and for long periods of time can result in fatigue and not being aleart behind the wheel. If you feel tired you should pull over and rest or change drivers. It’s a good idea to switch drivers every few hours. 4). 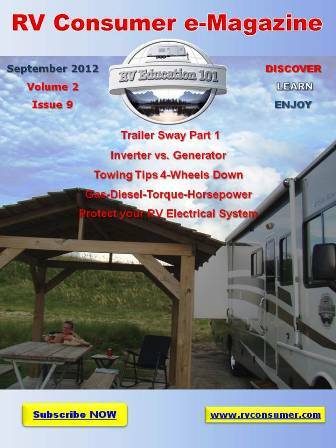 Avoid driving or towing your RV during inclement weather and in high winds. Because of the size and mass of many RVs it can be extremely dangerous to travel during periods of high winds. It’s better to get to your destination one day later than risk traveling in bad weather conditions. 5). Limit your driving time to 5 or 6 hours a day (300 to 350 miles). Not only will you be more alert, but you will arrive at the campground with plenty of day light to get set up and settled in before it gets dark outside. This gives you a chance to unwind and get rested for another day of travel, and to enjoy some of the amenities the campground has to offer. 6). Always leave plenty of room between you and the vehicle in front of you. An RV is much heavier than an automobile and requires more braking distance to come to a stop. This alone can prevent accidents, especially during emergency braking situations. Driving at a safe speed also lowers your braking distance. Always use a supplemental braking system on the vehicle you are towing behind a motorhome. 7). Drive defensively! Stay alert and monitor what is going on around you at all times. Adjust and use your mirrors. Note: Cell phones are nice to have for emergencies, but they can distract the driver. Do not use a cell phone if you are driving. If you must make a call or send a text have someone that is not driving do it for you. Plan your trip, travel safe and smart and enjoy your RV experiences. Remember, getting there is half the fun! 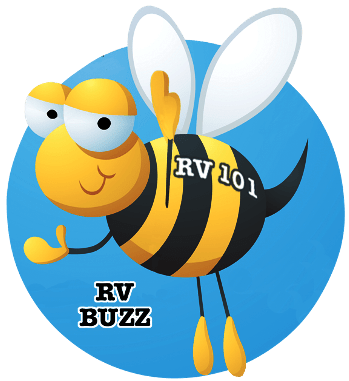 « RV 101® – Do you have an RV Emergency Escape Plan?